This dual speaker system can be used with practically any device that can accept a 3.5mm jack plug. The line-in input sensitivity means you can connect your computer or games console and amplify the sound of a video recording or game soundtrack. Or connect your MP3 player or phone and listen to the radio or music stored in your digital music library. And with a 450mAh capacity built-in lithium-ion battery (charged via the USB cable included) that can power your speaker for up to 3 hours you can go to the beach or the park without worrying about being near a power supply. Adding an external battery pack (not included) can increase the run time even further. 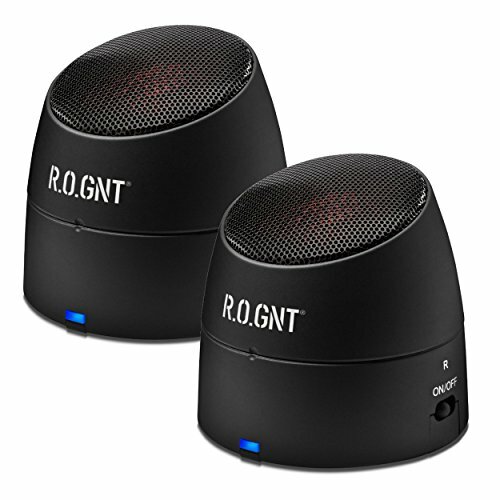 For terrific sound in powerful miniature form the Stereo Capsule Speaker from R.O.GNT, the perfect addition to your portable sound system. If you want to share the latest tunes with your friends from your MP3 player or phone you no longer have to huddle together to share a set of headphones. Just play the best music through this ultra-cool speaker so everyone can enjoy the party. The Stereo Capsule Speaker is so compact and lightweight you can take it everywhere in your pocket or bag. These adaptable speakers can be set up in two ways. For portability or if space is limited, the stereo speakers attach by a magnetic strip on the bottom to make one cylinder shape where the sound is projected from each end. Alternatively the speakers can be separated and placed apart to create a true stereo effect. In either configuration the sound is astonishing and with an output power of 2 x 3W and a frequency response of 280Hz to 16kHZ the sound is amazingly bright and clear for such tiny units. With great sound quality, portability, and compatibility with a wide range of devices, the R.O.GNT Stereo Capsule Speaker is the perfect playtime accessory and essential travelling companion. If you have any questions about this product by R.O.GNT, contact us by completing and submitting the form below. If you are looking for a specif part number, please include it with your message.